Does it hurt to turn your head? Can’t see as far over your shoulder as you used to? Neck pain is common in today’s society with about 1 in 10 people suffering from it at any one time. It can be due to a particular injury, like a car or sporting accident, or it may just develop over time. Often poor posture plays a role in neck pain. Postural neck pain is increasing in prevalence because of the increased amount of time we spend in front of computers, laptops or tablet devices. Quite often our posture in these situations is not good, or we are required to maintain these postures for a considerable amount of time and this puts an increased load through our neck. Consider that the adult human head weighs around 4.5-5kgs. Your posture plays a significant role on the ability of the neck and shoulders to carry this weight efficiently. When you slip into poor posture or your muscles and ligaments are compromised following an injury, much more muscular effort is required to hold your head up. You also then start to put your neck ligaments, discs and joints under strain. This can result in muscle spasm or pain, disc or joint injury, headaches (see section on Headaches), nerve compression or pain that radiates into your shoulder blade or arm. 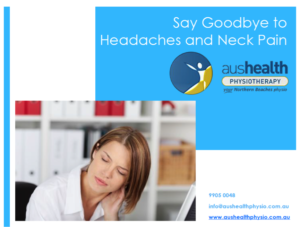 At Aushealth Physiotherapy we treat patients with neck pain daily and we get great results. We understand the complexity of neck pain and take an holistic approach to its management. We conduct a thorough assessment to ensure we fully understand your pain and all factors contributing to it. We then implement a customised management plan to address all aspects of your neck pain so you get the best treatment outcome and reach your treatment goals. We know that neck pain can impact on many aspects of your life, including work, sport, leisure time, sleep and even your ability to check your blind spots when driving. We can offer advice on all of these situations to ensure you return to your best as soon as possible and avoid re-injury. Call Aushealth Physiotherapy "Your Northern Beaches Physio" for an appointment with one of our experienced Physiotherapists today. For some safe, simple and effective tips to try at home, please click HERE to Download our fantastic Say Goodbye to Headaches and Neck Pain Guide.